Sugar Gliders just love to play with our Dingle Danglers! 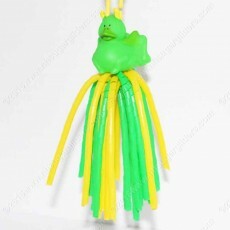 This is our Green Bug Ducky Dingle Dangler, with coordinating multi colored straws for lots of fun stimulating play. Dingle Danglers can be stand alone toys hung in the cage or also used as reset toys by attaching to larger toys and encourage play and foraging behaviors. Use in sugar glider cages and playrooms to enhance and provide enrichment play for sugar gliders. Created so toys can be easily attached and removed and for easy cleaning in hot water, dawn dish soap and white vinegar! All parts are tested and glider safe.